Since 1962, CCC student athletes have embraced the challenge of competition and have demonstrated a commitment to sportsmanship, team play and success on and off the playing field. 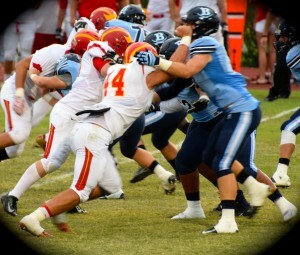 At Clearwater Central Catholic High School, we want our students to excel in both academics and athletics. We believe that athletics is a great way to teach fundamental values to our students while having fun and promoting exercise. At CCCHS, we use athletics as a way to teach our students to respect their opponents, learn how to work as a team, participate in good sportsmanship, and overcome adversity. Some may be skeptical with how well Catholic values and competitive sports mix, but at Clearwater Central Catholic High School, our Athletics Program focuses on just that. We know that winning is exhilarating, but playing while keeping our core values in mind is just as exciting. Our CCCHS athletes seek to compete to the best of their abilities while still treating teammates and competitors with honor and respect. Instead of cheating or searching for the easy way to win, we teach that good sportsmanship means recognizing that there are no shortcuts to true victory. At CCCHS, we believe that it is our duty to prepare our students for their future, both in and out of the classroom, and on and off the field. Our 40-acre campus is fully equipped with a newly turfed and lighted sports stadium, along with a newly paved track, practice fields, lighted baseball fields, batting cages, and a three mile cross country course. Our athletic program is not just about the athletes! We use sports as a way to foster a supportive community of both students and staff. No matter what the game, you will always see Marauders, decked out in full red and gold, supporting their fellow students from the stands. We even charter buses and let school out early whenever one of our teams plays an important game! Don’t miss any updates for the Marauders Athletic Program! Follow us on Twitter. Here at Clearwater Central Catholic High School, we are proud to have many talented alumni athletes. We believe in cultivating and creating a quality and competitive athletics program for our student-athletes. That’s why many of our seniors go on to sign Letters of Intent to play college sports. Even after college, many of our alumni move on to sign with professional sports teams! Our philosophy is to help students understand the importance of sportsmanship, teamwork, respect, and exercise so that they may grow up to lead a well-balanced life spiritually, academically, emotionally, mentally and physically.